KNOXVILLE, Tenn. (AP) — On a couple of occasions this season, Tennessee outside linebacker Darrell Taylor has resembled one of the most dominant pass rushers in the nation. Taylor’s four sacks matched College Football and Pro Football Hall of Famer Reggie White for the second-highest single-game total in school history. The single-game record is held by Corey Miller, who produced 4 ½ sacks in a 2013 victory over Kentucky. Taylor has a team-high seven sacks, but they all came in two games. He had three sacks in a 38-12 loss to No. 5 Georgia on Sept. 29 before his four-sack effort last week. All three of his forced fumbles this season also came in those two games. He had a fumble recovery and five tackles but no sacks in a 30-24 victory over Auburn last month. Nobody else on Tennessee’s roster has recorded more than three sacks this season. Taylor, a junior from Waverly, Virginia, entered this season with three career sacks. “Just focus on the little things, studying film, practicing the way I’m supposed to practice – little things like that,” Taylor said. Taylor’s performances against Georgia and Kentucky showcased his considerable potential. Taylor’s coaches want to see him play that way more often. Indeed, at least on Taylor’s final sack of the day, he never got touched on his way to the quarterback. Taylor’s pass-rushing ability could prove critical the next two weeks as Tennessee tries to secure a bowl bid. The Vols (5-5, 2-4 SEC) must win one of their two remaining games to become bowl eligible. They host Missouri (6-4, 2-4) on Saturday before visiting Vanderbilt (4-6, 1-5) on Nov. 24. NOTES: Pruitt is optimistic that safety Trevon Flowers will be able to play against Missouri. 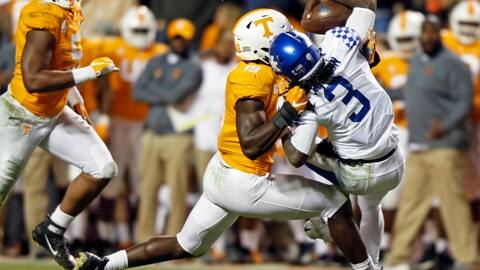 Flowers has missed Tennessee’s last five games due to a broken collarbone. … Cornerback Bryce Thompson’s status for the Missouri game is uncertain. Pruitt said Thompson got his “bell rung” against Kentucky.